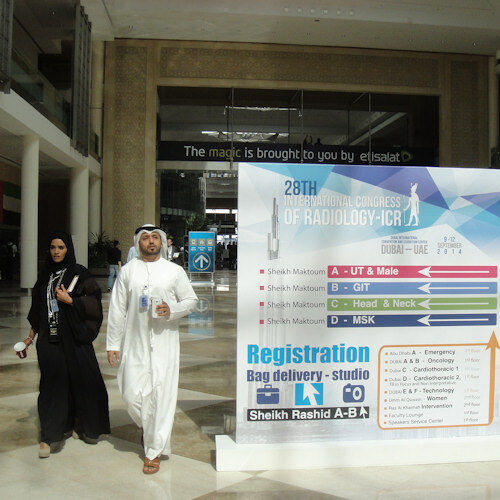 September 9, 2014 -- DUBAI - The International Congress of Radiology (ICR) opened today in what its organizers are billing as the largest-ever congress dedicated to radiology in the Arab world. Some 1,500 attendees registered on the first day and were treated to a wide range of opening lectures -- as well as balmy temperatures in the desert metropolis. 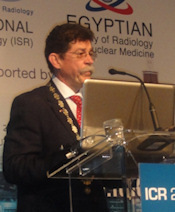 About 565 presentations by speakers from 57 countries are due to be given in 13 meeting rooms over the next four days, and 21 different national radiological societies contributed to the program, according to Dr. Wahid Tantawy, professor of radiology at Ain Shams University in Cairo, Egypt, and joint chair of the scientific program committee at ICR 2014. In spite of the long queues in the registration area on the first morning of ICR 2014, spirits were high and delegates remained amazingly calm, patient, and upbeat. Organizers reported 1,458 people had registered as of the first day of the meeting. That's a long way off from their optimistic objective of 5,000, but the event is still thought to be the Arab world's largest-ever radiology congress. Putting on ICR 2014 has been a huge challenge and many obstacles had to be overcome, according to Dr. Jan Labuscagne. Dr. Amina Belhoul spoke in Arabic at the opening ceremony. Given the change of venue from Sharm El Sheikh, Egypt, to Dubai, United Arab Emirates (UAE), last November, the temperature soaring above 40° C (104° F), and the relatively high hotel prices in Dubai, the meeting was always going to be a challenge, acknowledged Dr. Jan Labuscagne, president of the International Society of Radiology (ISR). "We are in Dubai because of the unfortunate circumstances over the past six years in Egypt, but now quiet and calm has been restored to the country, it is an attractive destination again," he said. "We must remember ICR has a long and rich tradition, and the name of the first president whose name appears on the chain I am wearing dates back to 1925." Building on this heritage, Labuscagne drew attention to two other milestones at this year's congress: the first joint World Health Organization (WHO)/ISR training course on justification of diagnostic imaging and use of referral guidelines, which he thinks will be crucial in the development of a radiation safety culture in the region; and the European Society of Radiology's decision to stage the European Diploma in Radiology examination for the first time at ICR. 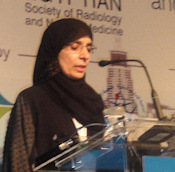 Every speaker at the opening ceremony warmly praised Dr. Amina Belhoul, president of the Emirates Radiology Society, and her colleagues in the UAE for their unwavering support for, and commitment to, ICR 2014. In her own speech, delivered in Arabic with an English translation on the big screen, she ended with the sentence: "May the peace, mercy, and blessings of Allah be upon you." The Egyptian delegation retains the hope that ICR 2020 will be held in Sharm El Sheikh. In the meantime, the next congress will take place in Buenos Aires, Argentina, in 2016. For our gallery of photos from the Dubai meeting, see below. Strong support for the congress has come from the ever-stylish locals in the United Arab Emirates. Radiologists have got the selfie bug, it seems. The only platinum sponsor for the congress, FujiFilm, is celebrating its 80th anniversary this year. Of the big four vendors, Philips is a surprising absentee this week. Red devils: Soccer players from Manchester United feature prominently in the Toshiba booth. The company opened a sports imaging facility in Manchester, U.K., in March 2014. Egyptian radiologists are incredibly proud to be so closely involved in the organization of ICR 2014, said Dr. Tarek El-Diasty, president of the Egyptian Society of Radiology and Nuclear Medicine, at the opening ceremony. The World Trade Center, the venue for ICR 2014, is also hosting a huge computer games show this week. ICR is taking a leaf out of the European Congress of Radiology's book by using floral displays in the registration area. 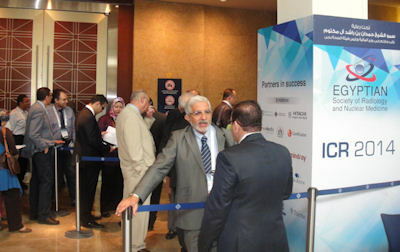 Long queues in the registration area meant some delegates missed the opening session at 10 a.m. There was also a shortage of printed programs. House rules: No less than 14 regulations have been drawn up for this week’s meeting. Smile please! Old friends and new from across the globe gathered in the registration area on the opening day of the congress. The opening lecture by Dr. Ashraf Selim, professor of radiology at Cairo University, focused on imaging of the royal mummies of ancient Egypt. This color volume-rendered CT scan of King Tutankhamen shows his elongated skull with an overbite. Carestream is the only gold sponsor at this week's ICR, and the vendor is demonstrating its latest digital x-ray and PACS products in the exhibition hall at Dubai's World Trade Center. ICR 2014 may be the hottest ticket in town for radiologists, but thousands of rock fans headed to Meydan race course on Wednesday evening for Lady Gaga's artRAVE spectacular. "Performing outside and giving all she got, ‘Gagaloo’ held up remarkably well in the heat, and although much of the crowd wasn’t always raving as Gaga would probably have liked, given the circumstances it was understandable," noted Time Out Dubai. The Swissray team is using ICR 2014 to inform delegates about its new fully owned Middle East office, which is due to open in January 2015 in Dubai, United Arab Emirates​, to coincide with the Arab Health meeting. "The branch will help us to have more direct contact with our customers," said Rajeev Singh (left), regional head for Middle East countries. Initially, the branch will have one sales person and three engineers, and it will be based in one of the city's free zones. Dr. Nicholas Gourtsoyiannis, a former International Society of Radiology and European Congress of Radiology president, gave the prestigious Beclere Lecture on Wednesday. He spoke about key issues in international radiology education and discussed the European experience. The European Diploma in Radiology (EDiR) examination has taken place during ICR 2014.